Our Germination Mat is guaranteed to increase your seed germination time and success rate. By adding a constant heat source, you can easily propagate seeds in your greenhouse or indoor grow room. MADE IN THE USA. *Available in 12″ x 5′ and 21″ x 5′ mat sizes. *Additional mats and thermostat also available. We tested this Germination Mat in our greenhouse germinating our vegetable seed and were very impressed. These mats allow you to get a jump start on the spring growing season by starting your plants early in your greenhouse or indoor grow room. Save money at the plant store this year by starting your own tomato, eggplant and pepper plants from seed. Made of heavy duty PVC, these mats provide even, constant heat to the bottom of flats and pots for superior germination. The RHT2 Thermostat has two outlets for plugging in the Germination Mat. The sensor probe is inserted into the soil to give an accurate temperature setting. It is an ideal unit for just one or two heat mats and it’s MADE IN THE USA!. Mats and thermostat include a two year warranty and are available in two different sizes 12″ x 5′ and 21″ x 5′. Additional mats and replacement thermostats also available. 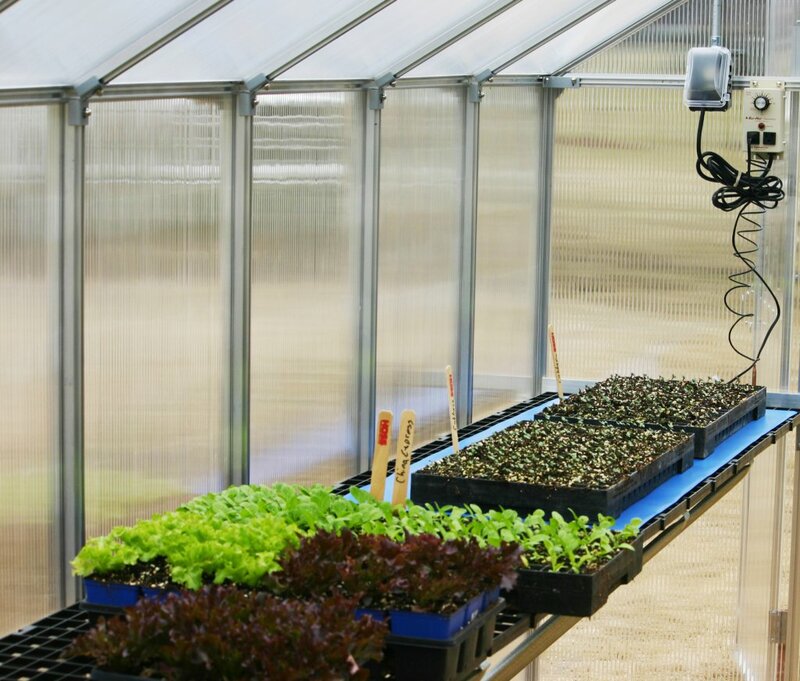 These units are extremely easy to install and portable so you can move them from one greenhouse to the next. These heavy-duty propagation mats are waterproof and each mat includes a 5′ cord and plug for 120 volt AC current.